I love a good documentary. Chris, eeehhh, maybe not so much. So, a couple weeks ago I netflixed (is that a verb?) 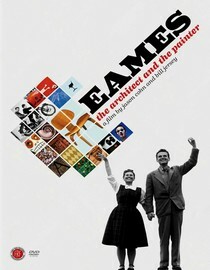 a documentary I knew we'd both enjoy: Eames: The Architect and The Painter. The movie is actually super interesting in it's own right because I didn't realize the Eames Studio did more than just chairs. As a communications professional, it was interesting to learn how they were both apart of and changed the way we communicate. What had me riveted, though, were the scenes that showed the Eames Studio. It struck me how cyclical design really is, and just how many design elements the Eames' incorporated in their office decor, that today we incorporate in our homes. Letters on the wall anyone? 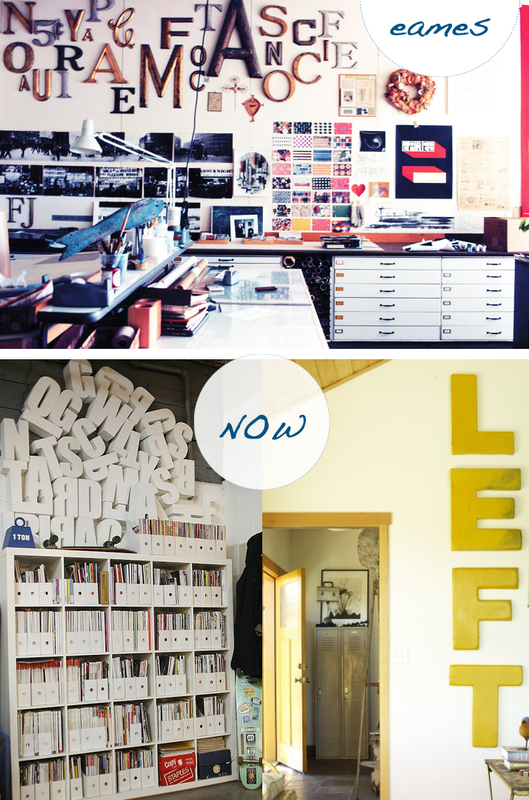 Letters and typography are hugely popular in design right now. You'll see them arranged as actual words to jumbles on top of bookshelves (which looks so cool, no?). 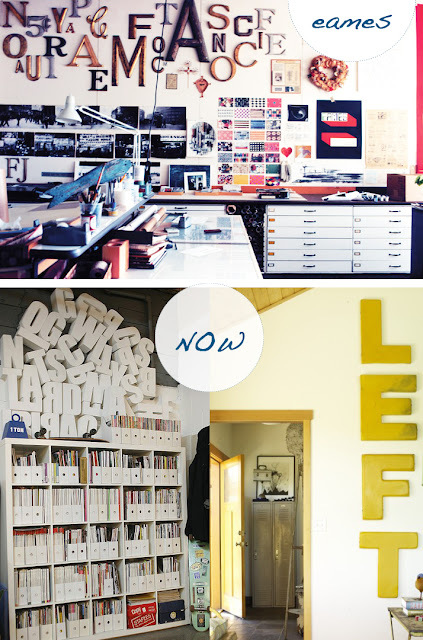 top: yatzer; bottom left: my ideal home; bottom right: desire to inspire. A gorgeous tapestry hung in Charles' office. 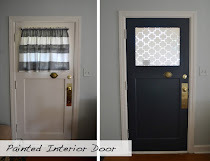 Looks today range from free hung tapestries, like his, to a more refined framed tapestry. Which I love. top: yatzer; bottom left: little green notebook; bottom right: urban outfitters. And, of course Eames had a gallery wall. Don't all the cool kids :). Gallery walls can still be seen casual, like his, or they can be seen framed and hung in any sort of arrangement - rigid, free-flowing, full wall or just a couple frames. 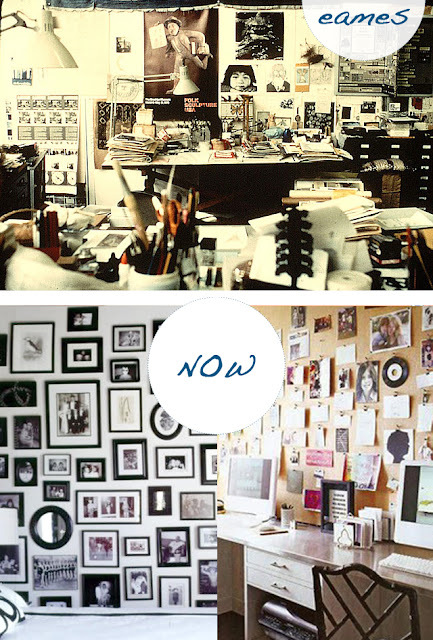 I would've LOVED to work at the Eames Studio. 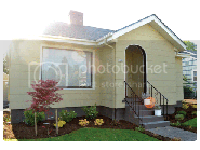 It looks so laid back and inspiring. 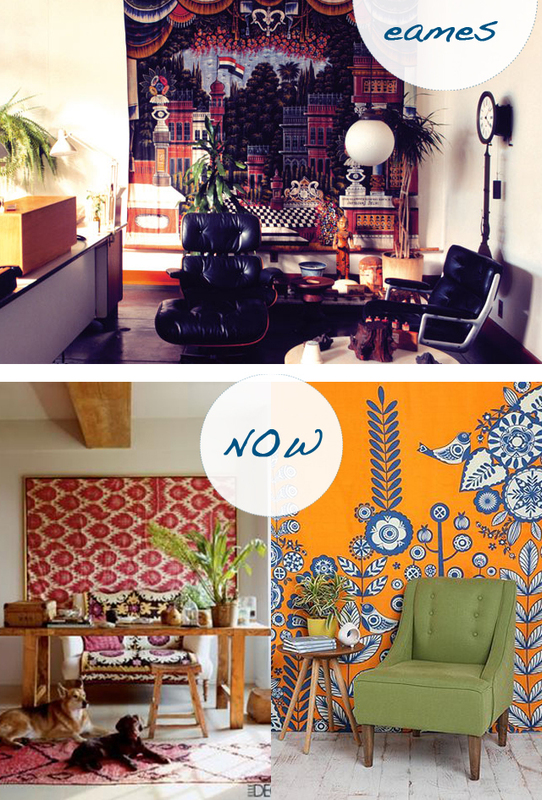 Which is actually how I strive to create my home: laid back and inspiring. What about you? Have you seen any good documentaries lately? Are you surprised that so many of today's decor trends were around in the 60's and 70's? Whoa! I am loving the jumbled white letters above that bookcase. I might have to Netflix that one too! We haven't had Netflix in a while but we've talked about starting up again since we're home at nights so much. I'm always so inspired but flipping through old design books, and I bet this movie is full of great inspiration like you've shown here. I picked up an auction book not long ago and it was amazing how many pieces of furniture Eames really produced. Thanks for sharing. Just watched this the other weekend on Netflix. Loved it! Good style never dies! Very interesting. I love when you can learn something while you watch a movie...I guess that's the point of a documentary, right? While it's not a documentary, we just watched The Big Year last weekend and I thoroughly enjoyed it. It has Jack Black, Steve Martin, and Owen Wilson in it and it's about birding! Totally caught me off guard. I love birds and it was a really neat movie. I think I need a gallery wall. Above my fireplace. Just sayin. Have a great weekend at the beach, friend!